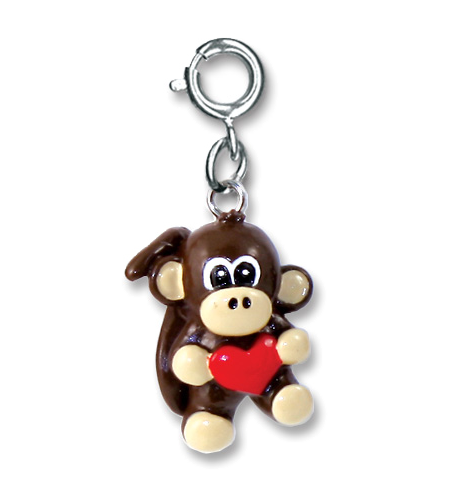 Monkeys are totally cute and this little CHARM IT! monkey charm has lots of love to share. Celebrate her spirit of fun and silly monkey business with this adorable CHARM IT! Monkey Heart charm. 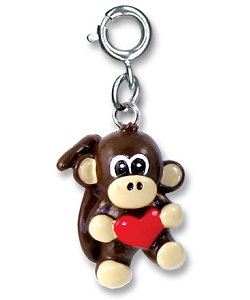 This cute little 3-dimensional monkey charm has a dark brown body with tan accents and holds a sweet red heart, a sure sign that monkeys and sweetness go hand in hand. With a simple snap of a clasp, girls can personalize their CHARM IT! jewelry. This cute little 3-dimensional brown monkey is all smiles as it rocks out to its favorite music from the music player in its lap. Owls are all the rage lately and this adorable CHARM IT! Owl Charm is sure to delight the owl fans in your life. This CHARM IT! Raccoon charm is oh-so-adorable with its 3-dimensional, two-tone gray enamel body. This cute little Baby Tiger charm has loads of personality and will look adorable on your CHARM IT! girl's bracelet. This adorable little monkey plush keychain has soft brown fur, tan , and a sweet, smiling face.